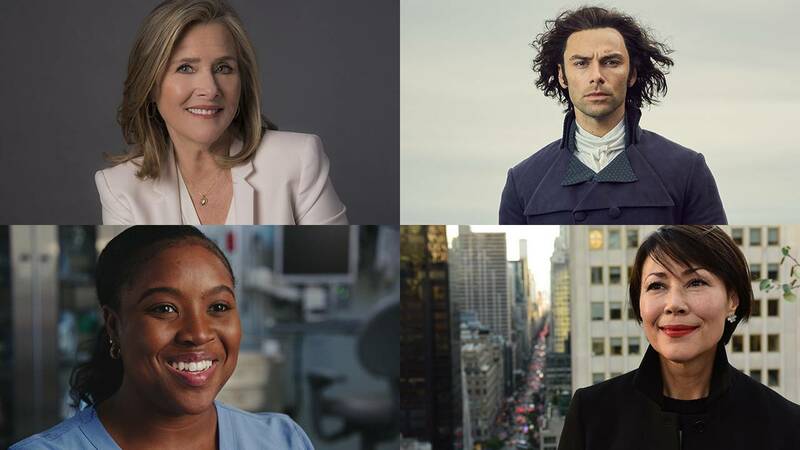 Clockwise from top left: Host of THE GREAT AMERICAN READ, Meredith Vieira (Courtesy of Stephanie Berger); Aidan Turner as Ross Poldark (Courtesy of Mammoth Screen for BBC and MASTERPIECE); Host of WE’LL MEET AGAIN SEASON 2, Ann Curry (Courtesy of David Turnley); Nurse Shantice Berry in MAYO CLINIC: FAITH – HOPE – SCIENCE (Courtesy of Christopher Loren Ewers). FRONTLINE dives into the recent controversies plaguing Facebook with its new documentary “The Facebook Dilemma” on October 29 and 30. The popular social network was first created with the goal of connecting the world, but several high-profile issues, including selling users’ personal information, exposed its darker side. The yearlong FRONTLINE investigation reveals how these problems have led some to wonder whether Facebook creates more harm than good. Sunday nights on PBS continue to be the destination for drama. Highlights include new MASTERPIECE series “The Miniaturist” premiering September 9, a new special ANNE OF GREEN GABLES: FIRE & DEW (September 23) and the new five-part series THE WOMAN IN WHITE premiering October 21. September 30 marks the return of MASTERPIECE series “The Durrells in Corfu” (Season 3) and “Poldark” (Season 4). WE’LL MEET AGAIN with Ann Curry returns Tuesday, November 13 for a second season of powerful personal stories that explore some of history’s most dramatic events. Premiering Wednesday, October 24 is SUPER CATS, A NATURE MINISERIES, which uncovers the secret lives of the big cats that thrive across the continents. And the four-part NATIVE AMERICA, premiering Tuesday, October 23, combines modern science with Native knowledge to explore the splendor and ingenuity of the world created by America’s First Peoples (watch a clip here). Premiering September 25 is THE MAYO CLINIC: FAITH – HOPE – SCIENCE, executive produced by Ken Burns and directed by Burns, Erik Ewers and Christopher Loren Ewers, which reveals how one institution has met the changing demands of healthcare for 150 years — and what that can teach us about patient care today. The promise of Facebook was to unite the world. But a series of recent controversies has raised the question: Is Facebook more harmful than helpful? This yearlong investigation goes inside the truth and consequences of Facebook’s rise as a global power. Discover how one institution has met the changing demands of healthcare for 150 years — and what that can teach us about facing the modern challenges of patient care. At the intersection of modern science and Native knowledge is a new vision of the world created by America’s First Peoples. NATIVE AMERICA reaches back 15,000 years to reveal cities aligned to the stars, unique systems of science and spirituality, 100 million people connected by social networks spanning two continents, and a past whose story has for too long remained untold. This special presentation of four films showcases a range of iconic American artists. Films include “Eva Hesse” (Friday, August 31, 9:00-11:00 p.m. ET), which tells the story of the 1960s art world icon who changed art history and women's place in the picture; “Everybody Knows…Elizabeth Murray” (Friday, September 7, 9:00-10:00 p.m. ET), following Murray’s journey to artistic maverick, voiced by Meryl Streep; “Wyeth” (Friday, September 7, 10:00-11:00 p.m. ET), uncovering the inner life of painter Andrew Wyeth; and “Basquiat: Rage to Riches” (Friday, September 14, 9:00-10:30 p.m. ET), exploring the life of anonymous New York graffiti artist turned ‘80s art world rock star Jean-Michel Basquiat. Hear intimate stories of the economic and social forces shaping Dayton, Ohio, a once-booming Rust Belt city where nearly 35 percent of residents now live in poverty. Pioneering graphics and captivating scientific case studies explore the internal mechanics of your body in vivid detail. Witness the fascinating and finely tuned systems that keep your body motoring – and the scientists guessing. Season 9 of the Peabody Award-winning "Art in the Twenty-First Century" series charts art-making in three urban centers across three continents: Berlin (Friday, September 21, 10:00-11:00 p.m. ET), Johannesburg (Friday, September 21, 9:00-10:00 p.m. ET) and the San Francisco Bay Area (Friday, September 28, 9:00-10:00 p.m. ET). From the post-Cold War cultural and economic rebirth in Berlin, to the dramatic fall of apartheid in South Africa and the technological boom in the Bay Area, the 12 artists and one non-profit art center highlighted in this season respond to the forces that have shaped the places where they live and work, while pursuing their personal visions for a better future. This annual all-star concert honors Neil Diamond, Tina Turner, Queen, film composer John Williams, New Orleans funk band The Meters and other recipients of the GRAMMY Lifetime Achievement, Trustee and Music Educator awards. The Virunga Mountains in the Democratic Republic of Congo are home to two of the most dangerous, spectacular, and least understood volcanoes in the world. In this one-night, two-part NOVA special, an intrepid international team of volcano experts climb up to their summits, perilously close to their gigantic craters, to deploy innovative imaging and remote sensing techniques. They’re seeking clues to the forces at work deep beneath the volcanoes that are splitting East Africa apart, to predict when the next devastating eruptions could occur and to save the lives of large numbers of people who live in the shadow of these monsters. Uncover the shocking history of the eugenics craze that swept the nation in the early days of the 20th century – a campaign to breed a better American race which turned a scientific theory of heredity into a powerful instrument of social control. Delve into America’s opioid crisis – in a world in which many other diseases can be traced to addictive behavior, how do addictions work, and what can the science of addiction tell us about how we can resolve this dire social issue? Join chef Vivian Howard after the harvest season as she hosts a special harvest feast for the show’s most beloved personalities to gather for one last batch of quintessential Southern ingredients. Meet three of the 200,000 former “comfort women” kidnapped and forced into military sexual slavery by the Imperial Japanese Army during World War II. Seventy years after their imprisonment, they give their first-hand accounts of the truth. Uncover the history of the Concorde, the passenger plane that flew from the late ‘70s until 2003 at twice the speed of sound. Today, scientists are working to build a new generation of quieter, greener and cheaper supersonic passenger planes. Forest and wildland fires are growing larger, more frequent, and deadlier every year, threatening millions of acres and thousands of lives. Meet a firefighting crew as they struggle with fear, loyalty, love and defeat over the course of a single wildfire season. What emerges is a quietly powerful story of a small group of men – their exterior world, their interior lives and the fire that lies between. Television’s longest-running performing arts anthology, featuring the best in music, dance and theater, presents a month’s worth of Broadway-themed programs, including the Tony Award-winning production of “An American in Paris The Musical;” a live production recorded in the U.K. of “Rodgers & Hammerstein’s The Sound of Music;” John Leguizamo’s latest theatrical showcase “John Leguizamo’s Road to Broadway;” and “Hal Prince: A Director’s Journey,” a retrospective look at the 60-year career of this Tony Award-winning producer and director. Following the tragic fire on Apollo 1 that killed three astronauts, it looked as if the U.S. space program would screech to a halt and lose the race with the Soviets to reach the moon. But Apollo 8, the first mission to circle the moon and return astronauts safely to Earth, proved that the U.S. was still in the game. NOVA looks at the engineering innovations in rocketry and navigation that Apollo 8 pioneered, and that ultimately made the 1969 lunar landing possible. Extensive interviews with all three Apollo 8 astronauts – Frank Borman, James Lovell and William Anders – as well as scientists, engineers and mission controllers reveal how a can-do spirit and a willingness to adopt new technologies for the first time led to a much-needed success in space for the United States and perhaps even saved the space program. Ring in 2019 with an extraordinary New York Philharmonic New Year’s Eve concert. The legendary New York Philharmonic, led by new music director Jaap van Zweden, celebrates the intersections between classical music and dance, ranging from the waltzes of Johann Strauss to the gigues and sarabandes of the Baroque era, and much more.